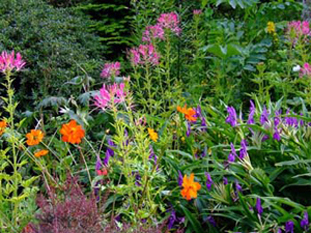 Pinsla Garden & Nursery is a romantic 1½ acre artist’s garden. 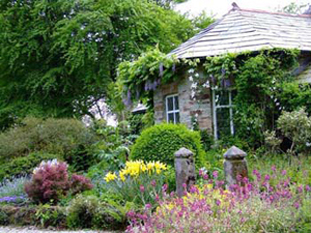 Naturalistic planting, imaginative landscaping and pretty sculpture surround an 18th Century fairytale cottage set in tranquil woodland. 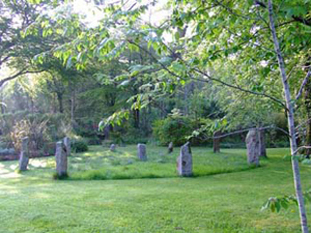 Stone circle, winding paths. Good selection of shade loving plants including perennials, ferns, acers, ground cover, bamboos and succulents grown in the garden and for customers in our high quality nursery. Mythical stoneware garden statues are on display and for sale. Pinsla is four miles east of Bodmin, between Cardinham village and Fletchers Bridge. Take the Cardinham Woods turning from the A38, continue for 2 miles following the brown signs to Pinsla. Or, from the A30, go to Cardinham village and drive out past the C of E Church, continue for 2 miles and Pinsla is on your left.